The PATRIA society was established at the beginning of the nineties of the 20th century, and as a mission, it resolved to restore the Slánský obzor yearbook banned in the fifties of the 20th century. In 1993, the first issue appeared. It was in the year of the historical Slánský obzor centenary. The Slánský obzor has restored the yearbook tradition, and in 2007, the fourteenth volume has already been issued in restored form. Recently, some significant books with regional focus have been published by the PATRIA society. 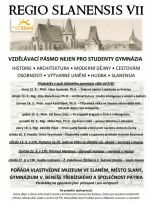 The PATRIA society participates at a number of cultural events, it has instigated inauguration of a lot of commemorative plaques for significant personalities in Slaný, Smečno, Zlonice, and Kladno. The founder of the PATRIA society, its first chairman and the restorer of the Slánský obzor is Dr. Vladimír Dvořák. At the present time, Dr. Václav Moucha serves as the chairman.